yea this need to be off topic I think. (or just skip it if you'd like) to find two ? Blocks to your right. Super Mario, a Super Leaf. Now, you have two options. the clouds. Take off from there to fly until you see a pipe to land on. Take it down to find coins in the shape of a 3 (for Super Mario Bros. REJOINED: Jump onto the Koopa Troopa and kick its shell to the left. the blocks here turn to coins. Collect them all before going right. level! Congrats on your first level completed. reappear by the pipe you just took. Avoid the Venus Fire Trap and go right past two Goombas to reach a hil. Goomba flying overhead. It drops enemies called Mugger Micro-Goombas. right past them to find the card, the end of the level. just right of the leftmost ? Block, you'll make a red Jump Block appear. Bounce on the top and press A as you go up to reach "coin heaven." that scrolls to the right constantly, making you move with the screen. bounces back) for a 1UP Mushroom. row of coins and then drop down until you have them all on the plank. Now continue right to see a Koopa Paratroopa floating up and down. them and go right to the card. Mission complete! Good stuff bane I want more. "Pick a box. Its contents will help you on your way." Mushroom, a Fire Flower, and a Super Leaf. Easy, enough, right? "Line up the pictures and get a prize! You only get one try." a 5UP. You know what to aim for. were big, it is a Fire Flower. to a doorway. Press Up on the D-Pad to take it. gaps and run right to the wall. Stand there to avoid being crushed. Take the door when you can. this beast quite easily. As it runs toward you, jump on its head. Locked Door on the map is now destroyed. Huzzah! Can you get suspended for posting multiple off topic posts with little to no context? Or how about reporting people live on Twitch? Asking for a friend. I liek mudkipz, do yue? Mudkip, known in Japan as Mizugorou (ミズゴロウ), is a Pokémon species in Nintendo and Game Freak's Pokémon franchise. Created by Ken Sugimori, Mudkip first appeared in the video games Pokémon Ruby and Sapphire and subsequent sequels, later appearing in various merchandise, spinoff titles and animated and printed adaptations of the franchise. Known as the Mud Fish Pokémon, Mudkip first appeared in 2003 in Pokémon Ruby and Sapphire, as one of three starter Pokémon the player can choose from at the beginning of the games. Mudkip have appeared on the boxart for Pokémon Mystery Dungeon: Blue Rescue Team, Pokémon Pinball: Ruby & Sapphire, Pokémon Channel, and Pokémon Dash. Mudkip, known as the Mud Fish Pokémon, are small blue Pokémon with a large fin on their head that allows them to sense movements within the air and water, acting as a radar. While in the water, they use the orange, spiky gills on their cheeks to breathe while using their large tail fin to propel themselves. They are extremely strong, despite their small bodies; they are able to lift or crush large boulders. When sleeping, they bury themselves within the soil at the edge of the water. 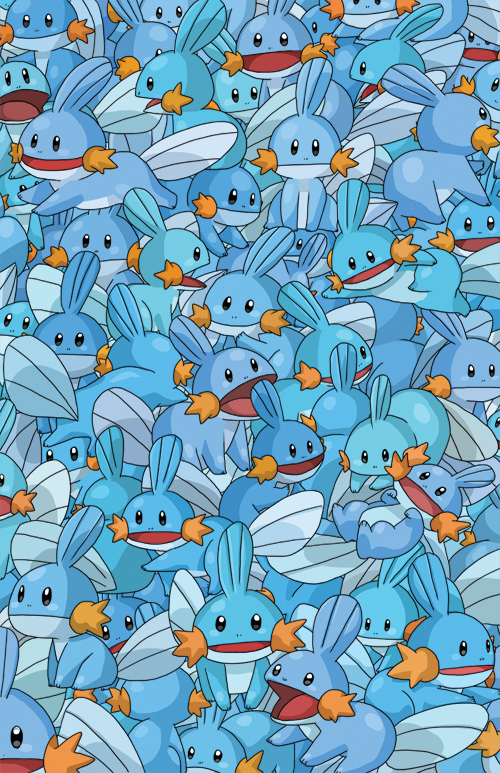 Mudkip and members of its evolution family dwell in swamps or other wetlands, deep inside isolated islands, because of their dislike of fresh water lakes and ponds. According to The Illustrated Encyclopedia of North American Reptiles and Amphibians, Mudkip and its evolutions are based on salamanders, although IGN has said that it was "like the real-life creature known as the mudskipper, which inspired both the monster’s design and its name". Mudkip first appeared in Pokémon Ruby and Sapphire and its remake Pokémon Emerald. Mudkip is one of the three starting Pokémon that players may choose from including Treecko and Torchic. After gaining enough experience in battle, Mudkip evolves into Marshtomp, which will then evolve into Swampert. In Pokémon HeartGold and SoulSilver, Mudkip, along with Treecko and Torchic, can be obtained from the character Steven Stone after obtaining all 16 badges and beating the final boss, Red. Outside of the main Pokémon titles, they appear in Pokémon Pinball: Ruby & Sapphire, Pokémon Trozei!, the Pokémon Mystery Dungeon titles, the Pokémon Ranger titles, Pokémon Channel, and PokéPark Wii: Pikachu's Adventure. Mudkip appears in Super Smash Bros. Brawl as a trophy that can be obtained through special means. mabe i should just mail my fans and talk to them that way? Can someone post an image of a Teddiursa. I'm not a member. why was this moved to OT mabe because you where talking OT im sick of this i cant for once just have a good post wile that coin post is still not in OT. my post said warzone stuff. Lol thanks guys. I am so cute. Also here's my recipe for a peanut milkshake. Try it! 1 cup of cold milk of any kind. 1/4 to 1/2 cup of roasted peanuts. Add all ingredients to a blender, and blend on high speed until peanuts are well blended and product is smooth and frothy.